We’re looking for a few friendly, outgoing volunteers to help out with the NH Tourism Booth at the 2018 New England Brewfest at Loon Mountain in Lincoln. Plan to engage guests in conversation about NH and its attractions, and pass out literature (highway maps, NH Visitor Guides, and more). There will be two shifts for 2 volunteers each: 2:30-5:30pm and 5:30-8:00pm. If they don’t fill up right away you may sign up for both, but please e-mail Naomi before you do. As a volunteer, you will be on the grounds, but not considered an event patron and will not receive a wristband enabling you to take part in the beer tasting (vendors are not allowed to drink), but there will be some great people watching, and there is also live music! If you would like to attend as a patron when you are off duty, you will need to purchase a ticket separately. Slope side at the Governor’s Lodge at Loon Mountain Resort in Lincoln (60 Loon Mountain Road, click here for Google map). On-site parking is free. Our table will be outdoors under a tent, and although there will be chairs, you would need to be able to stand while interacting with guests. Full GSA uniform – GSA shirt, name tag, khaki pants/shorts/skirt, and appropriate footwear (you will be outdoors standing on grass.) There will be room under the table to stash a jacket and small bag. If you have questions before the event, e-mail Naomi (naomi@nhgsa.com). 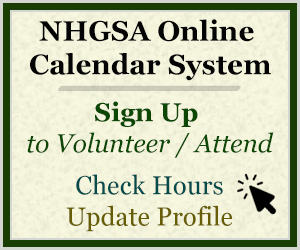 During the event the NHGSA Manager on duty will be Claire Moorhead, and she will reach out ahead of time with her contact info for the volunteers who sign up.